Whilst Gigajam’s Essential Skills courses focus on teaching individuals to play rock and pop instruments, we appreciate that many pupils play other, more traditional instruments in school ensembles. For Gigajam, creating musicians is not just about creating rock musicians, playing in rock bands. It is about providing opportunities for a wider engagement in music of different genres, styles and contexts. We have designed the Gigajam Rock Orchestra to help teachers incorporate the live performance of the rock band, into the wider setting of a Rock Orchestra. 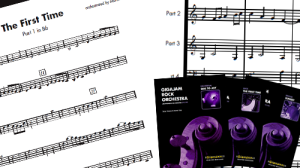 This provides an exciting opportunity for instrumentalists in school orchestras to play along with their rock band peers.The arrangements are written so that a typical school orchestra can perform the five pieces taken from the Gigajam Level One Songbook. Each piece has a full conductor’s score arranged in five orchestral parts, plus charts for the guitar, bass, keyboard and drums. The individual orchestral parts can be assigned to different instruments and the appropriate charts printed off in the correct keys. 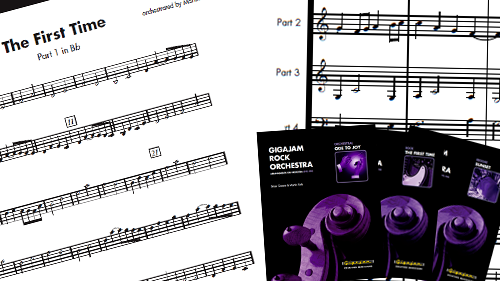 Gigajam Rock Orchestra also includes mp3 audio files with mixes including: band and orchestra, orchestra only, band only, and various minus-one mixes. This enables the different ensembles and individual parts to be practised by students with great sounding accompaniment. All six rock orchestra pieces are now available on gigajamvle.com and you can try Ode To Joy freely. The School Music Performance Award, Rock and Pop exam grades debut, grade 1-5 are now live. 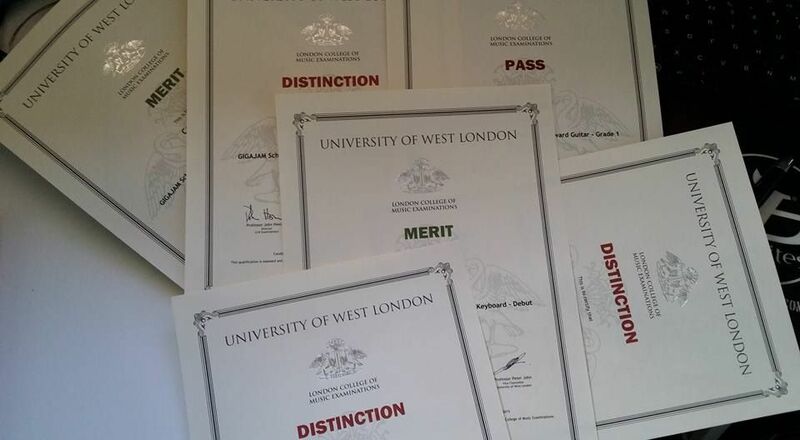 The qualification is awarded by University of West London/London College of Music Examinations and schools can now enter candidates automatically online when the student is ready to receive their award. When a student has completed the required elements of the award: technical exercises, graded pieces, and knowledge and understanding questions, these will be evidenced in the students portfolio. Teachers simply need to verify the integrity of the portfolio for the specific grade and this will then automatically confirm that the student can now be entered for their award. Once the teacher has verified the portfolio, they will be able to enter the candidate via the Staff Room. All students eligible for entering for their award(s) are listed. To ensure the school receives the credits for the award please add the learners unique learner number and your National Centre Number. 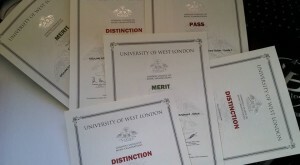 The award is confirmed by London College of Music Examinations and the certificate sent to the school (exam centre). The School Music Performance Awards table is below showing fees, points and Ofqual qualification details. The qualifications are inexpensive and offer a great opportunity for learners to be accredited for their hard work. 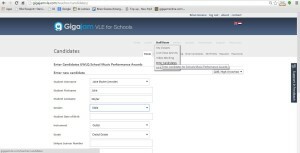 Students in schools can learn and receive awards by using Gigajam VLE http://gigajamvle.com. Learners studying independently should use Gigajam Online http://gigajamonline.com and their work will be verified by Gigajam teachers. Some video evidence and proof of identity will be required when not enrolled with an educational establishment. These new and innovative qualifications, regulated by Ofqual, have been created in direct response to the government’s National Plan for Music and are designed to enable more students, at school and at home, to learn to play a musical instrument and receive recognition for their progress. The School Music Performance qualifications are suitable for beginners through to intermediate players through a series of graded exams. Debut to grade 5 are available for guitar, bass, keyboard and drums. 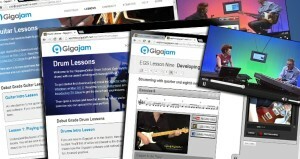 Students learning using Gigajam simply complete the exercises in their chosen instrument and upload and store their performances in their e-Portfolio. They can do this using either the video capture or award winning Analyser software. At the end of each grade they then have five songs to perform and store, proving their skill and fluency in performing on their instrument. Their class teacher will then verify two specified exercises from the course, along with one song to confirm that the portfolio is consistent with the level the student is performing at. The qualifications are able to be affordable for schools and parents as the system of delivery and assessment is highly efficient. The list of qualifications and costs are listed below. 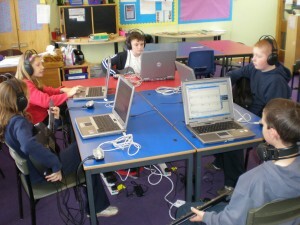 Gigajam courses are just £1 per pupil per annum, minimum charge £150 per annum. Hub licences are negotiable on an individual basis to include all schools and educational establishments in a Music Education Hub, but based on 1.5% of Music Education Grant. Visit our Music Hub site to see how technology can help your hub reach more pupils in and out of school. The formal launch date is yet to be announced. Please contact us now to find out more about the University of West London/London College of Music and Gigajam and how to enter your candidates. Gigajam’s new music training programme is now being delivered up and down the UK to Music Services, Music Education Hubs, Secondary Schools and Primary Schools. Here is a short video of a recent training day, with primary teachers, none of which are music specialists. If you are interested in a training day with Gigajam to help you develop the delivery of instrumental tuition through the use of technology, then please contact us to discuss your requirements. 3/ Consider and reflect upon a variety of teaching with technology pedagogies. •Register and login teachers and students to GigajamVLE. •Select and follow instrumental lessons, using narrated text, ‘how to’ videos, and TV Shows. •Use the Gigajam Online Audio Player to practice and play along with exercises. •Use Gigajam Xtractor software to practice, play along and record exercises. •Use Gigajam Analyser to receive feedback on record performances. •Upload and store performances in e-Portfolio, place and receive comments, and link to video/audio performances. •Use the teachers’ staff room to monitor and moderate students’ work. 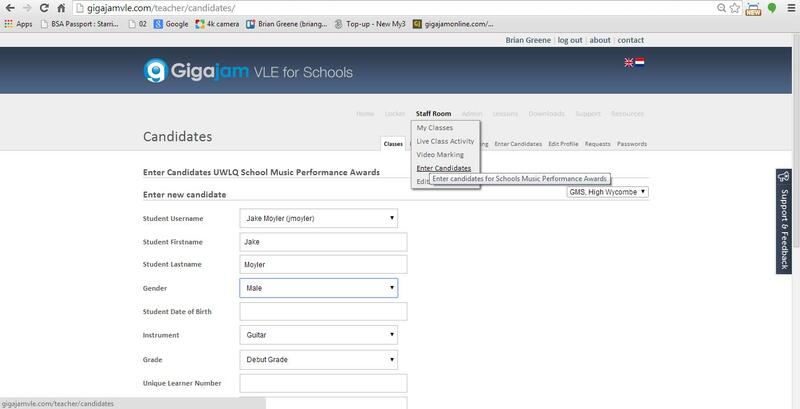 •Be able to provide Gigajam with list of students so that classes can be created automatically. •Be able to connect MIDI instruments to computers by installing Gigajam software suite and MIDI instrument drivers. Gigajam will once again be attending the Federation Music Service Conference, this year at Wyboston Lakes in Cambridgeshire on Friday 15th and Saturday 16th June 2012. Director Brian Greene will be on hand to demonstrate Gigajam in action, talk about how Gigajam is being used in 100’s of secondary, primary and special schools up and down the UK. He will be focused on how Gigajam can support Music Education Hubs use technology to provide all students with the opportunity to learn a musical instrument over a sustained period of time. Brian said ” Our school clients are growing, as is their use of Gigajam, increasing the amount of chances pupils have to learn a musical instrument. Many schools, who have moved to our new VLE service have uploaded multiple thousands of exercises, as is evidenced from our leader board (http://gigajamvle.com) and that is growing everyday. Although there may appear to many opportunities to study on the web, it won’t take long before you realise that the quality is variable, the pathways are unclear and almost none have any progression or differentatiation. 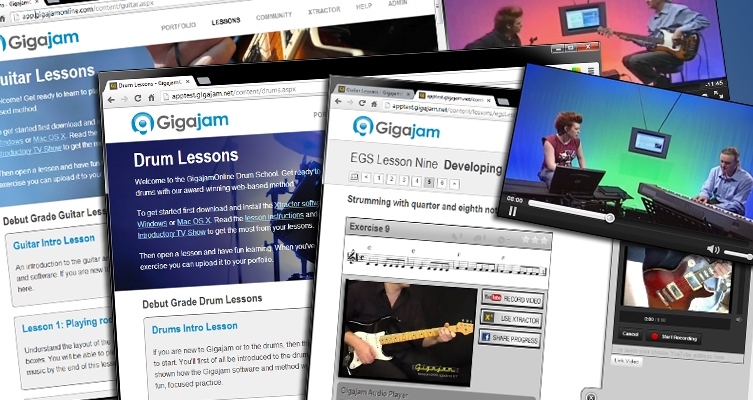 What can be guaranteed is that Gigajam remains the only truly comprehensive music pathway for guitar, bass, keyboard and drums online that provides true interactivity, personalised, independent & blended learning, together with continual, formative and summative assessment. 1. More for Less – Harnessing technology to increase scale & reach: – Gigajam is available anytime, anywhere, helping music services significantly increase their current offer to schools and complementing existing activities. 2. 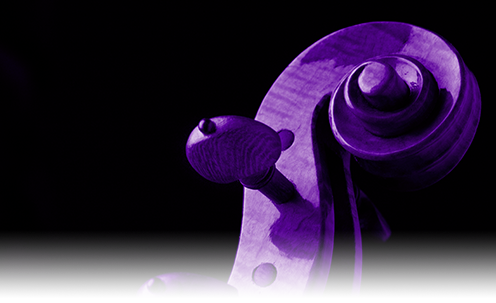 Available to ALL: – Gigajam can be made available to all schools and all their students, in school and at home, giving every child, irrespective of their needs or background, the chance to learn a musical instrument in class and online for free. 3. Large Savings to Hubs: – Gigajam will be heavily discounted to Hubs, in return for a single licence, making it genuinely inexpensive to provide a Hub wide licence that includes each and every school and educational establishment within the Hub area. 5. Affordable, Sustainable & Flexible: – Gigajam Hub charging model is calculated at a rate of 1.5% of formula, so the price is linked to available funding. The cost of a licence will therefore reduce as funding reduces, making it truly sustainable. Gigajam will also be happy to negotiate fees according to local context. 9. Increase Demand for Music Lessons: – Gigajam will help increase the numbers of pupils choosing to learn an instrument with music service teachers. 10. Fun, Engaging and Rewarding:- Gigajam provides real instrumental skills through interactive eLearning, enabling students to develop tangible and transferable skills so they can engage fully in a wider music curriculum and be able to join in a broad range of ensemble opportunities. It may not be specified in the National Curriculum that students should learn how to play a musical instrument but few would disagree that, if possible, it would help students engage more deeply in music making. Noise, space, equipment and specialist knowledge are some of the key reasons why teaching instrumental skills in class has been so difficult historically. Technology, though, can play a huge role in supporting the classroom teacher make instrumental learning in class possible, easy and fun. 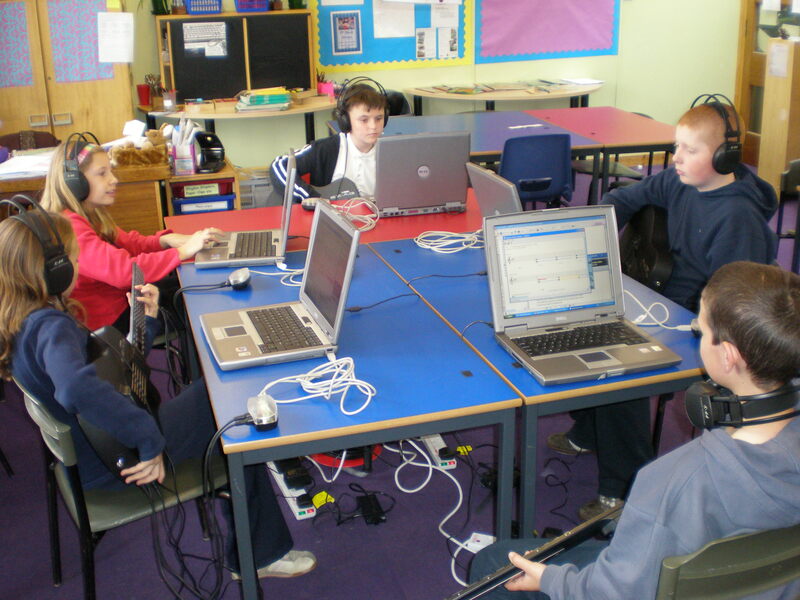 Gigajam was designed to be delivered so that pupils could experience what it is like to learn one to one, whilst in a class group. It also encourages students to come together and play and perform live, as well as equip them with the skills they need to compose and record. Ideal for years KS2 (Y6), KS3 (Y7, Y8, Y9) and KS4 (Y10, Y11). Gigajam is also being used as enrichment for 6th form colleges.